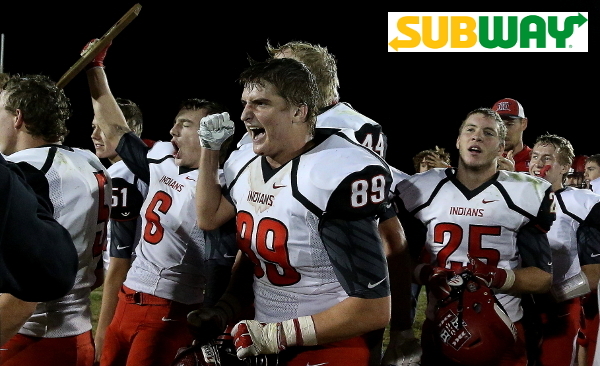 On this Friday Playoff edition of the Subway Fresh Take, we’ll recap semifinal playoff action from Friday night. Blue Valley North 44, Blue Valley 37 – Blue Valley North advanced to a state football championship game for the first time in school history with a 44-37, double-overtime victory at Blue Valley. The Mustangs and Tigers ended regulation tied 30-30 and both scored in the first overtime. Blue Valley took a 37-30 lead on a Luke Bernard pass to Owen Olson. North responded with a Graham Mertz 10-yard scramble on the Mustang’s first play to tie the game at 37. Blue Valley North got the ball first in the second overtime and scored on Mertz’s 1-yard sneak on third-and-goal. The Mustang defense then came alive. Darin Robertson made a great open-field tackle on Alex Totta for a 4-yard loss on a screen play. The Mustangs then sacked Bernard at the 17-yard line on second down. Bernard’s third-down pass in the end zone was broken up, and the fourth-down pass in the end zone fell incomplete sealing the win for Blue Valley North. Defenses controlled the second half after the two teams combined for 48 first-half points. The Tigers led 27-21 at halftime before North scored 9 points in the third quarter to lead 30-27. Jackson Likens tied the game for Blue Valley with a fourth-quarter field goal. Derby 53, Wichita Northwest 41 – Derby advanced back to the Class 6A state title game for the third consecutive season with a 53-41 win over Wichita Northwest. The Panthers scored 21 points in the fourth quarter to turn a 35-32 deficit into a 53-35 lead. The key play came of the game when the Panther defense stopped Northwest running back Breece Hall on 4th-and-goal from the 1-yard line. Derby then marched 99 yards and scored on a Hunter Igo 1-yard run to take a 39-35 lead that they wouldn’t relinquish. Igo scored again to make it 46-35 before the Panther defense returned a Grizzly interception for a touchdown to lead 53-35. Igo rushed for more than 150 yards and three scores, while Brody Kooser added 114 yards on the ground. Northwest was led by Hall’s 139 yards and four touchdowns. St. Thomas Aquinas 55, Mill Valley 21 – Two-time defending Class 5A champion Mill Valley’s run for a third consecutive Class 5A title ended with a 55-21 loss to St. Thomas Aquinas. The Saints avenged semifinal losses to Mill Valley the past two seasons by rushing for 389 yards in the game and forcing three Jaguar turnovers. Aquinas led 35-7 at halftime and 48-14 after three quarters. Will Swanson rushed for 127 yards and a score, while Cameron Jackson added 118 yards on the ground and three touchdowns for Aquinas. Swanson also passed for 83 yards and a touchdown. Mill Valley was led by senior quarterback Brody Flaming who passed for 261 yards and two scores and rushed for 139 yards and another touchdown. Bishop Miege 56, De Soto 24 – De Soto led top-ranked Bishop Miege for most of the first half before the explosive Stags scored 28 consecutive points to take a 35-17 halftime lead. Jack Barber scored two first-half touchdowns as the Wildcats built a 17-7 lead on Miege in the second quarter. But Miege would answer with a Brison Cobbins 74-yard touchdown run to pull within 17-14, and a Jasir Cox pick-6 gave the Stags a 21-17 lead with 6:50 left until halftime. From there the Miege offense got rolling. Cobbins and Cameron Clark broke touchdown runs to give the Stags the 35-17 halftime lead. De Soto pulled to within 35-24 in the third quarter on Barger’s third touchdown run, but Carter Putz connected on two touchdown passes to Daniel Jackson and one to Quinn Schieber to allow the Stgs to pull away for the win. Putz became the all-time passing record-holder in Kansas during the game surpassing Will Schneider of Shawnee Mission North who finished his career last season with 8,901 passing yards. Andale 20, McPherson 13 – Traditionally a run-oriented program, Andale took to the air in defeating McPherson, 20-13. Andale quarterback Ethan Baalman passed for 203 yards and three touchdowns in the win. The emergence of the passing game was a necessity against a Bullpup defense that shut down the Andale rushing attack to 22 total rush yards on 33 carries. Baalman hit Mason Fairchild on a pair of first-quarter touchdown passes as Andale led 13-6. Baalman’s pass to Andrew Mohr made it 20-6 just before halftime. McPherson pulled to within 20-13 mid-way through the third quarter on a Jace Kinnamon 14-yard run, but could get no closer. Andale forced five McPherson turnovers in the game. Frontenac 37, Topeka Hayden 21 – Frontenac used a strong defensive performance in the second half to advance past Topeka Hayden and to a state football championship game for the first time since 2000. The Raider defense returned two interceptions for touchdowns – both more than 90 yards – and shut out the Wildcats in the second half. Riley McDaniel’s 94-yard pick-6 gave the Raiders a 28-21 lead in the third quarter. Frontenac added a Trey Harris 30-yard field goal in the fourth quarter to take a 31-21 lead. Hayden drove inside the Frontenac 20-yard line mid-way through the fourth quarter, but Brendan Ishimura picked off Sampson Huston’s pass and raced 97 yards for a 37-21 lead. Jake Wilbert led Frontenac with 139 of the Raider’s 242 yards on the ground. He also scored two touchdowns in an exciting first half that ended with the game tied 21-21. Holcomb 34, Scott City 14 – Holcomb’s defense returned two interceptions for touchdowns and shut down Scott City’s running game in a 34-14 victory. Peyton Leonard picked off Scott City quarterback Parker Gooden on the first play of the game and returned it 24 yards for a touchdown. Scott City answered to pull within 7-6, but later in the quarter, Reece Morss’ 20-yard pick-6 gave Holcomb a 13-6 lead. The Longhorn offense then took control scoring 21-consecutive points over the second and third quarters to lead 34-6. Morss led a balanced offense with 103 yards rushing and a touchdown, while Trey Gilbert passed for 150 yards and a score. Holcomb is back in the 4A-II title game after claiming the state championship in 2015. Sabetha 17, Silver Lake 14 – Sabetha advanced to the Class 3A title game with a 17-14 victory over Silver Lake. Clinging to a 10-6 lead in the fourth quarter, Sabetha Gabe Garber intercepted a Silver Lake pass at the 33 and returned it to midfield. A couple of plays later, Garber broke free for a 42-yard touchdown run that gave the Blue Jays a 17-6 lead. Silver Lake added a touchdown at around the 1-minute mark, but the Blue Jays recovered the onsite kick to preserve the victory. Sabetha rushed for 288 yards in the game led by Mason Engelken who tallied 82 yards and touchdown after Silver Lake had taken an early 6-0 lead. Joe Gruber added 77 yards on 19 attempts and Garber 76 yards on 11 carries. The Blue Jay defense held Silver Lake to 77 rush yards on 24 attempts and picked off three Eagle passes. Sabetha has won two state football championships in school history - those coming in Class 4A in 1993 and 1997. The Blue Jays in the Class 3A state title game for the first time since 1986 when they finished as runner-up to Smith Center. Marysville 30, Phillipsburg 24 – Atreyau Hornbeak’s two-yard touchdown run with 3:32 left in the game propelled Marysville to a 30-24 victory over top-ranked Phillipsburg. The Bulldogs held a 22-21 lead entering the fourth quarter before Phillipsburg’s Jonathan Hunnacutt connected on a 20-yard field goal to lead 24-22. Hornbeak’s third-quarter touchdown gave the Bulldogs a 22-21 lead after Phillipsburg’s John Gower broke a 14-14 halftime tie with a 1-yard run in the third quarter. Hornbeak rushed for three scores in the win that put Marysville back in the state title game for the first time since 2009. St. Mary’s Colgan 15, Olpe 12 – In a game dominated by long, time-consuming drives, Colgan’s defense stopped a pair of Olpe two-point conversion attempts to preserve a 15-12 victory. The win puts the Panthers in the Class 2-1A state title game for the first time since 2010. Colgan took the opening possession of the game and marched 71 yards on 13 plays taking a 7-0 lead on a short Max Wilson touchdown run. Olpe would answer by converting a Colgan fumble into a touchdown drive to pull within 7-6. That score would remain until halftime, but the Eagles opened the second half with a scoring drive resulting in a Blaine Hinrichs 7-yard run and a 12-7 lead. Olpe spread the field on the two-point attempt and the pass was broken up in the end zone, but Colgan was whistled for pass interference. Hinrichs was then stopped short up the middle on Olpe’s second attempt. Colgan responded right back with a Bryce Hutchins 1-yard run and two-point conversion pass to Jeremiah Buche to lead 15-12. Olpe drove to the Panther 28-yard line, but a fourth-&-12 pass to the goal line was batted down and Colgan took over with just over a minute to go. Smith Center 51, Plainville 0 – Smith Center advanced back to the Class 2-1A title game for the first time since 2009 with a dominating 51-0 victory over rival Plainville. The Redmen scored 24 points in the second quarter to build a 30-0 halftime lead. Trace Haven, Hesston Maxwell, and Jesse Staples all rushed for two touchdowns each in the victory. The Redmen had defeated Plainville 16-7 in the season-opener, but avenged two losses to Plainville last season. St. Paul 43, Burlingame 34 – For the second consecutive week, St. Paul ran off a barrage of second-half points in knocking off one of eight-man’s top teams. St. Paul trailed Burlingame 34-20 late in the third quarter, but scored the game’s final 23 points to win 43-34 and advance to a state championship game for the first time since 2002. St. Paul quarterback Braven Born hit Caleb Pecha on a 24-yard touchdown pass to pull within 34-28, and tied the game with a 15-yard pass to Adam Albertini with just under five minutes remaining. The Indian defense, which shut out the Bearcats in the second and fourth quarters, held Burlingame on downs to get the ball back with a little more than two minutes left. Albertini then broke a long run inside the Bearcat 5. Born scored from 4 yards out shortly after to give St. Paul a 40-34 lead. Pecha intercepted Bearcat quarterback Montana Giffin and St. Paul converted a 37-yard field goal by Alejandro Mate on fourth down to push the lead to two scores. Hoxie 44, Spearville 20 – Hoxie used a physical run game to run over Spearville, 44-20, and advance to the school’s first state football title game since 1981. The much bigger Indians broke a 14-14 tie with a 1-yard Jared Kennedy touchdown with 5 minutes left in the second quarter. The Hoxie lead grew to 28-14 in the third quarter after the Indians converted a Spearville interception into points. Latham Schwarz then added a pair of touchdown runs in the second half as Hoxie pulled away for the 44-20 win. Hanover 36, Pike Valley 24 – Top-ranked Hanover pulled away from No. 2 Pike Valley to advance back to the state championship game for the fourth consecutive season. The Wildcats and Panthers were tied at 6 at halftime before the scoring started to pick up. Pike Valley scored twice in the third quarter to lead 18-14 after three. But Hanover answered back with a long touchdown pass to take a 22-18 lead early in the fourth quarter. After a stop, Hanover connected for another long scoring pass to lead 30-18. The Wildcats extended their lead to 36-18 with a touchdown with just under five minutes remaining before Pike Valley would add a late touchdown. Hanover has now won 24 consecutive games. Hodgeman County 42, Otis-Bison 16 – Hodgeman County blitzed Otis-Bison 42-16 to get back to a state title game for the first time since 2013. The Longhorns raced out to a 28-0 halftime lead and eventually led 36-0 before Otis-Bison got on the scoreboard. Jacob Salmans rushed for 160 yards and three touchdowns and added 104 passing yards and two passing touchdowns to Trevor Morgan. Morgan grabbed five catches for 93 yards. Otis-Bison won the regular-season meeting, 58-26.